I started fishing Ruddock when I went to Southeastern and I bought my first boat thanks to the GI Bill in 1991. Back then the boat in picture two cost me $6,995 with 40 hp mariner brand new with galvanized trailer, riveted fisher marine boat nicely laid out, and my note was $121 a month. Dad who is the Ruddock picture went on his birthday October 3, 1991 to co-sign for me to get this boat at Cooper Marine. That was the days when a young guy could get a new or nice used truck under $10k Nissan hardbody, nice boat, and fish total cost gas and launch under $20. I think with fees today it is hard for a young person to get in the sport. Anyway Ruddock is fixing to hit due to bass school up going toward fall. I know this due to I been fishing this since I started at SLU after the war in 1991. Got my information from Billy Able Sporting goods in Hammond and over the years now go to Roussel’s tacke off Hwy 55 Laplace for my info. Ruddock a shad base area and you can catch big fish, but average is like picture with my father. Mostly use small bagley shad baits, smaller bombers stick baits, slap sticks, love smaller rapala, smaller rebel (love rebel) Arkansas shad wee r and stick baits. Winter, spring, summer fish runouts on west or northwest wind. Have caught bass spawing right in pits next road at Ruddock due protected water. This year on Superbowl Sunday I caught a limit of Kentucky bass in a protected area off I-55 canals all feeding off one runout. 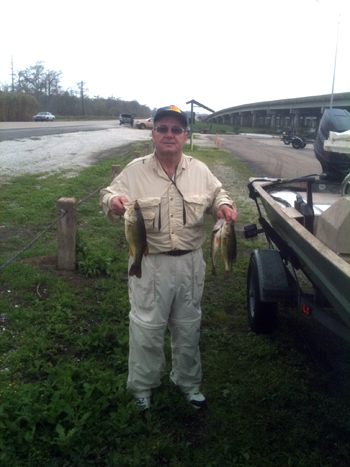 Smaller bass typically in I-55 canal larger bass are in Maurepas. Then this time of year lake Maurepas traditionally calms down and water clears. I fish from Ruddock canal to Oil Field canals to reserve canal. Fish French fry plastics, smaller senko, stickbaits, and smaller H&H mini spins. I go to Roussels off Hwy 51 in Laplace to get my French fry plastics one of the few guys that has them. You can typically catch a little larger bass mixed with once in blue moon redfish. Again I learned this lake from years and years plus listening to other people fishing it.